Apple has certainly made it easier over the years to maintain your computer's performance. I recall the days of the G3, and earlier, when I would defrag the hard drive every other week and the time it took to do that. No longer is this as necessary as it was but your data is really only as safe as the condition of your hard drive and while the regular use of the Disc Utility found in your Applications/Utility folder keeps things in good working condition, a more complete and powerful tool may be in order. By regular hard drive maintenance, you protect your disc from failing and losing important data. At the same time, this maintenance can speed up your computer making things run more efficiently. Prosoft's Drive Genius 2 is like a Swiss Army knife of maintenance tools which comes equipped not only to more efficiently maintain your hard drives but also to provide management and optimization tools. 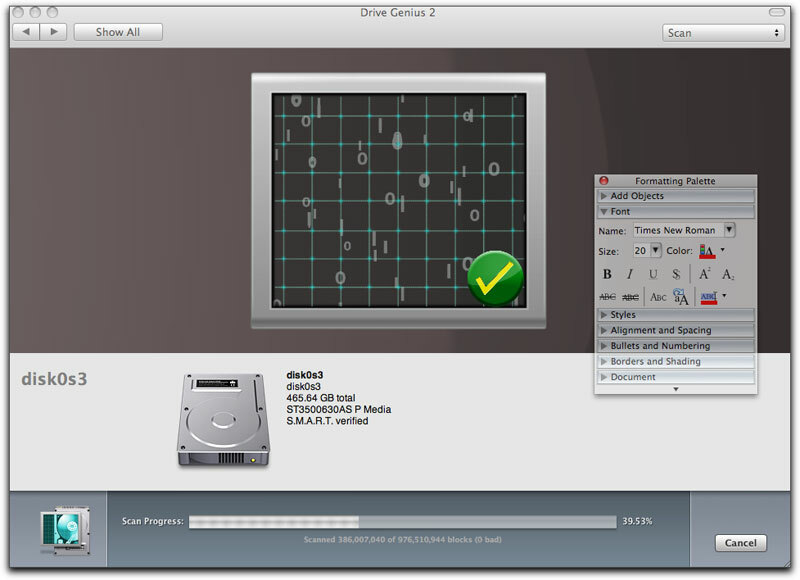 When first installed, either off the Drive Genius 2 DVD, or directly off your hard drive, a unique, graphical, animated interface comes up. There are two pages of possible tools divided into the 3 categories of maintenance, management and optimization. Bringing your mouse over any of the icons brings it quickly forward with the icons name. Should you launch a particular tool, a new window opens up allowing you to specify the hard drive you want to work on. The whole interface of Drive Genius 2 is plain cool to look at even when running any of the different tools. Despite current popular believe, hard drives can get fragmented as files grow and shrink. In the maintenance section you have available the ability to defragment either your boot drive or any of your externals. If defragging your boot drive, you would need to do this off the disc and not the installed application should you have previously installed it. This is done by inserting the disc, doing a restart while holding down the C key until it boots off the disc. It took a few minutes to boot up but all went well. At first a scary screen opens up warning you that possible data loss may occur. Actually, they are doing you a favor, as this is a good reminder that you should have a backup of all data before doing anything. Don't let it scare you, just remember to clone and back up anything you can't risk losing. A test utilizing the defrag tool from the Drive Genius 2 installed application on an internal 500 gig extra drive showed me that defragging remains a very time consuming process. My test started at 6:32 pm and by 7:55 it was 42% completed, by 9:06 it was getting there at 73% and just as I walked back into the room at 10:20 pm it finished with 100%. That's a total of 3hrs, 48 minutes for this drive. 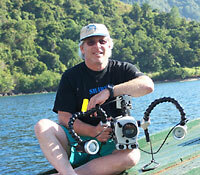 Of course, the time it might take you would be dependent upon how much was in the drive and its frequency of use. This 500gig drive has seen plenty of trouble free use. Interestingly enough, after booting from the Drive Genius 2 DVD itself intending to defrag the 750gig boot drive, the defragmentation process took 3 hours, 12 minutes. That's less than the 500 gig internal drive I used for several Final Cut Pro projects. More than likely running the defragmentation tool on your boot drive which is filled up with applications, plug ins and other necessary data would be expected to be practically a whole day affair so I would recommend running it either overnight while you sleep or on a day that you will not need to use the computer for other purposes. The disc in the window never stops spinning as the defrag percentage counts down along the progress bar. While I will not report on each tool's personal use, in addition to the Defragment tool, there is Drive Slim whose purpose is to free up space on your hard drive with duplicate, large file, language support and removal. It also finds files that you haven't used in a long period of time that you may consider removing. Drive Slim can be quite useful for dumping all the languages you have installed and might never need. It is also an excellent way to locate ancient files or documents just taking up hard drive space and reclaim that space for more necessary purposes. Repair, which works just like the Repair Permissions in your Utilities folder but is said to be able to find errors that Disc Utility may not. 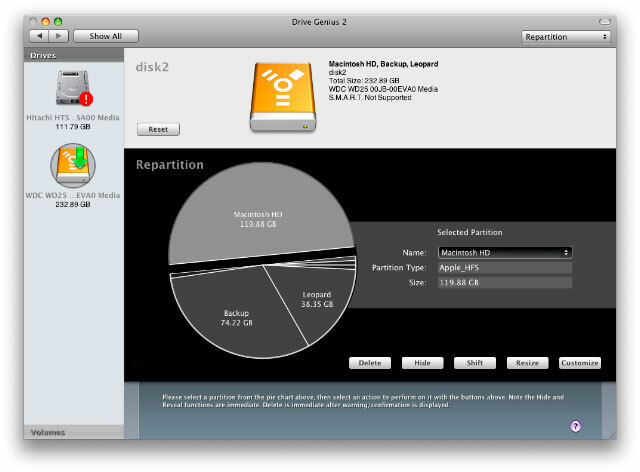 The Repartition, allows you to add, delete, hide, expand or shrink OSX partitions for more optimal organization of your hard drives. 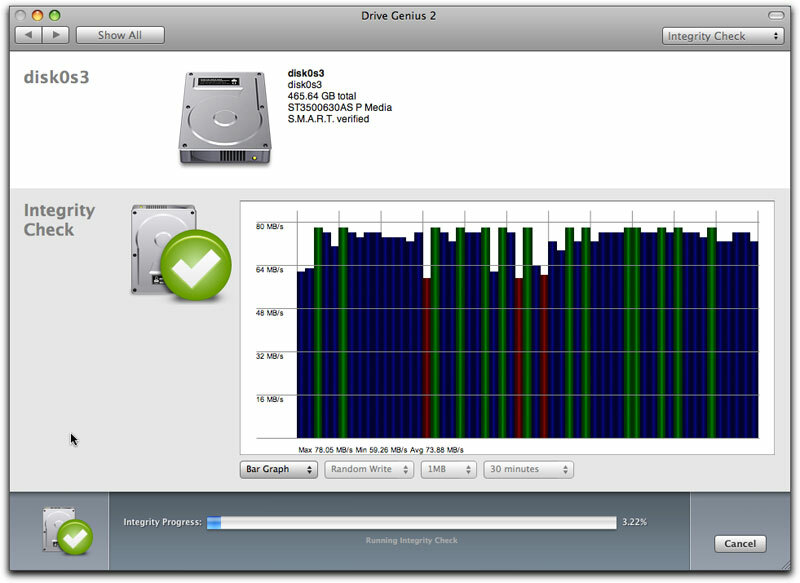 An excellent graphic layout provides clear and specific illustration of your drive utilization. Note that my boot drive is not available. I would have to run Drive Genius off the disc to be able to do that. The Integrity Check enables you to locate problems before they locate you at a crucial moment. What you do should a problem show up is up to you, but at the very least, you will be warned to back the drive up before it crashes all together. The Clone tool allows you to back up volume or the entire drive. Shred is a supplied tool that removes all traces of data on any drive or OSX volume. This can be set to a choice of 1 to 35 passes for optimal trashing of data. The Benchtest tool allows you to see a graphical readout of the speed of your drives to compare to your hard drives past performance or to other drives. Info does just that, provides information on space utilization of all drives or OSX volumes. There is a drop down menu to chose the computer that you are using. I run a dual core 3Ghz Mac Pro, but don't see it in the menu. I would imagine there may be a few others therefore who would not be able to get an accurate reading. I mentioned this to their tech support but there really was no clear answer for this. Initialize allows you to quickly format any new drives you may add to your system. Sector Edit fine tunes all aspects of your system with direct advance byte viewing and editing of all data on your drives, volumes and files. A warning is included with Sector Edit that only expert users should use this. It sounds too dangerous for me so I skipped trying this one out. 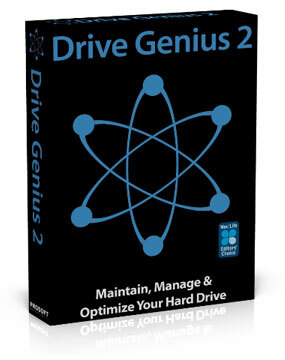 Additionally there is really no instruction that comes with Drive Genius 2 to show you how to use it properly. Finally, there is the Scan tool, which verifies your drive's reliability with a complete suite of non-destructive read verifications. Basically it finds bad blocks of 50 MBs or more. It works at approximately 3 minutes per gigabyte. I started the Scan program on that same 500gig internal drive I defragged and exactly one hour later it is now 37.8 % complete. Every once in a while, a square filled with streaming ones and zeros comes on Matrix like with a big checkmark inferring that the block just finished scanning is OK. I'm not sure what it would look like if a block were not okay but 2 hours and 31 minutes later the scan was now complete with no bad blocks. 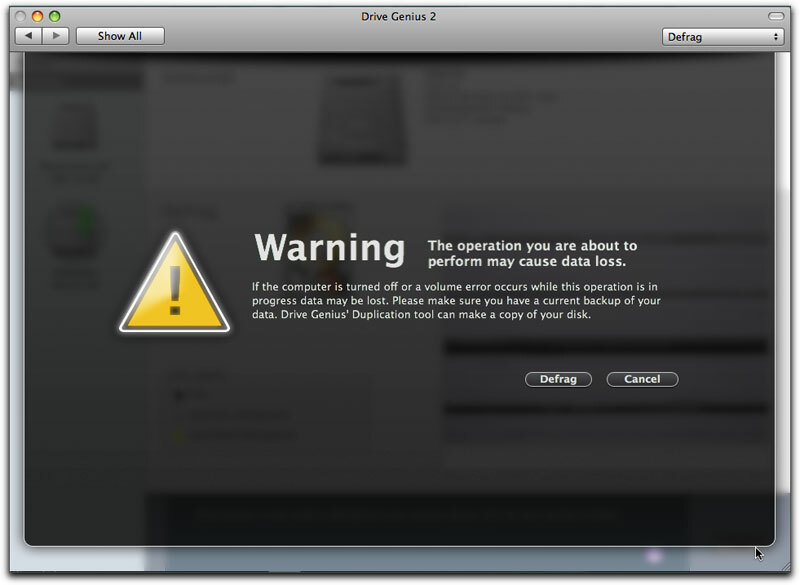 It goes without saying that it is wise to have a complete backup of all data before using Drive Genius 2. This was confirmed in a conversation that I had with one of ProSoft's very helpful and informative tech support people. 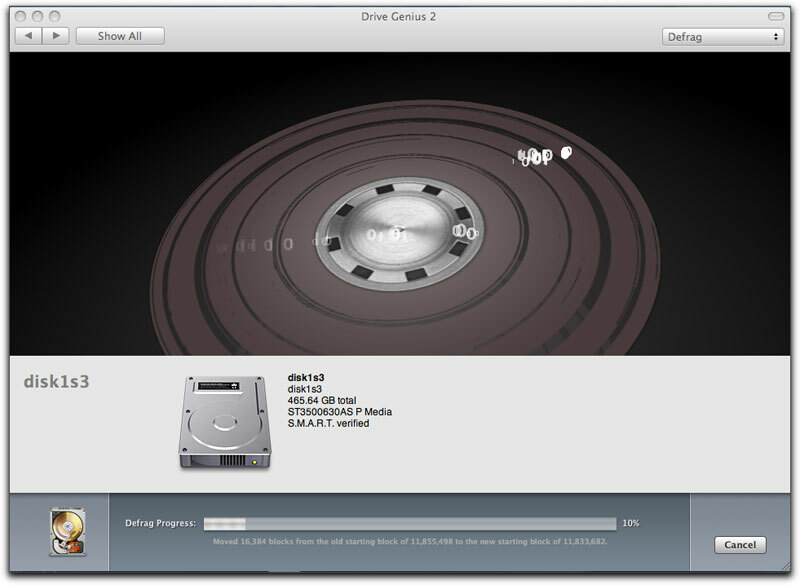 Drive Genius 2.1.1 requires a DVD drive, Mac OS 10.4.9 or newer, 256mb ram and a 1.0 GHz processor minimum. To start up from the bootable DVD, hold down the C key as the computer starts up. With Drive Genius installed, I had no problems at all in using it. 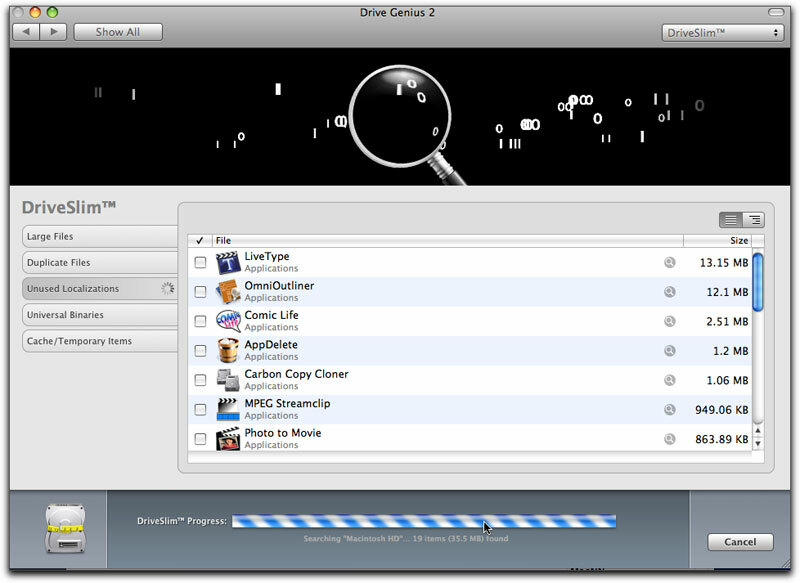 Yes, many of the functions do take a long time to complete but you will not need to use Drive Genius that frequently. Just consider it an excellent tool to use as part of your regular computer maintenance tasks and you should be happy.